With Halloween, bonfire night, Christmas and New Year coming up, the party season is well and truly underway (and no we can’t believe this year is almost over either!) While the fireworks and festivities are a joy to us humans, our furry companions can struggle during this time. 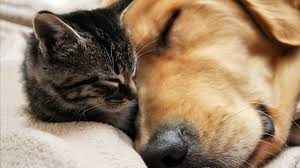 At Brown’s Natural Pet Store, we’ve compiled a list of our favourite calming remedies and tips to keep you and your pets chilled this winter. 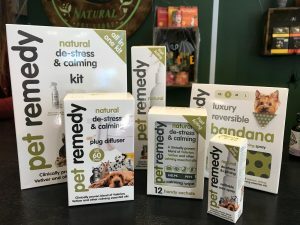 At Brown’ Natural Pet Store, we have many products that can help alleviate these issues, although if you’re concerned your pet’s reaction is severe then we can recommend you a behaviourist or trainer that can assist you further. Calming products can be given externally or internally, and even in combination with each other. Plug in diffusers are always popular, whether the pheromone based Feliway or Adaptil, or herbal Pet Remedy. They work by gently encouraging the animal’s neurotransmitters to send a calming message to the brain. Alternatively, the spray versions can be applied to your dog’s harness or a bandanna for extra support when out walking. We’ve found the Pet Remedy to be a particular favourite of cats as it contains valerian, which can have similar “happy” effects to catnip. 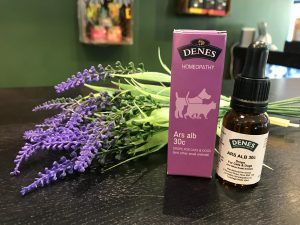 If you’re a fan of homeopathy, we stock the Denes range at Brown’s – try Arsenicum Album 30c especially if your dog is restless or particularly anxious. The HomeoPet TFLN (Thunderstorms, Fireworks, Loud Noises) is a non- sedating formula specifically designed for animals who struggle with these events. Both are given in oral doses dependant on the weight of your pet. Dorwest Herbs have been producing herbal remedies and medicines since 1948, so it’s no wonder they are one of the top sellers at Browns this time of year. The Scullcap and Valerian tablets can be given daily as general support for nervous or excitable pets, or as a treatment dose for stressful events like fireworks or long journeys. Additionally, the Valerian Compound liquid can be used in conjunction with the tablets to provide an almost instant boost. 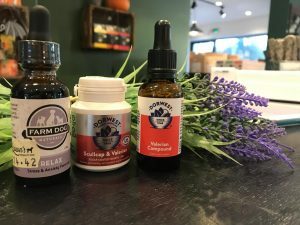 If you want something fast acting you can also try Farm Dog Relax, a blend of calming aromatherapy oils that which can applied externally throughout the day of the event. As always our consultants are on hand at our Goring and Ferring stores to advise you, so please ask us for help if you need it.